Get the diary out and mark the date, Women in the Wilderness is coming! Women in The Wilderness is our exciting new programme run by female instructors, with a focus on helping women feel empowered while getting hands-on in the outdoors. The programme is split across two weekends with different experience levels, so you can choose the best fit for you. WITW:P1 will run on 16-17 February 2019 and is based at Borland Lodge, the perfect setting for an introduction to the outdoors. 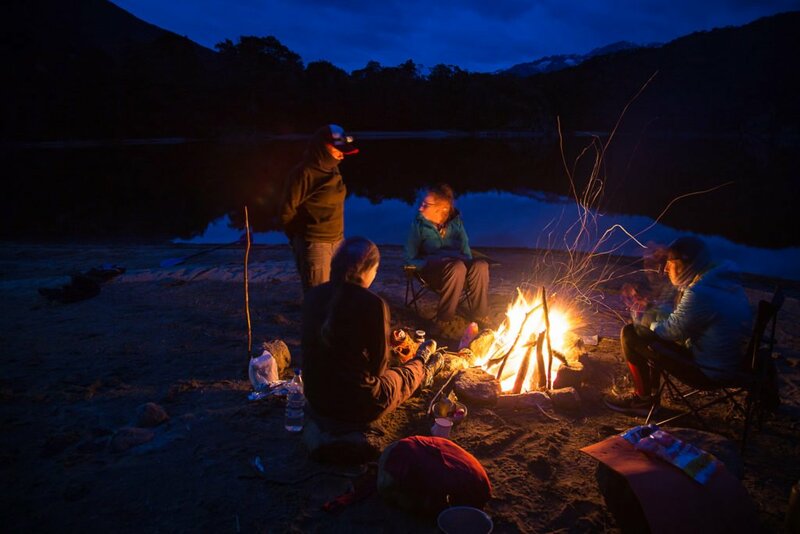 With Fiordland National Park on the backdoor step, you’ll get to experience some amazing locations within a short distance of camp. This programme covers a variety of activities including bushwalks, archery, climbing and abseiling at the local crag. Our experienced instructors are looking forward to passing on their broad knowledge with some basic bush craft lessons too. We’ll finish with a trip through the top section of the Clifden Caves. You’ll need to squeeze and scramble but it’s worth it! The cost of this programme is $270pp and includes accommodation at Borland Lodge. We will be meeting at Borland Lodge (1hr 40 mins from Invercargill) so you will need your own transport to the Lodge. A packed lunch for day one is essential, but all other meals will be provided. WITW:P2 is a journey through Fiordland designed for the adventurous-at-heart. Starting from Borland Lodge, a 2.5 hour tramp will get you to a large limestone Rock Bivvy where we will camp for the night. You’ll learn some cool new tricks, including fire building, and try your hand at rock climbing and abseiling before finishing the weekend with a trip through the upper and lower sections of the Clifden Caves. There’s a bit of walking involved so you’ll need to dust of the tramping boots. This programme is $230pp and includes food, however you will need to bring a packed lunch for day one. We will be meeting at Borland Lodge (1hr 40 mins from Invercargill) and you will need your own transport to the Lodge. Both programmes are packed with a wide variety of activities and skills suitable for a range of ages and abilities. The programmes will run independently, but if you’re a beginner and keen for something more challenging you might like brush up on some basic skills in February before joining the journey in March. To register for either of these programmes (or both!) get in touch to request a registration form.